Fundraising goal attained + D23 Expo recap! Another huge round of thanks to my fantastic expanded crew of triathlon supporters for their donations on my behalf: Jenae M., MAC, Shari E, and Caritta L! That thermometer on my page has been moved all the way up to the target amount by August 18, before the deadline of August 26. Together the tri team was able to rally enough supporters to raise over $11,000 in 10 hours that day. Now that’s teamwork! On September 18, our consolidated contributions will be donated to make a difference in the lives of some very special kids utilizing the services at CHLA. I’ve had a superb week and topped it off with an exciting visit to the D23 Expo in Anaheim on Saturday. Lightning McQueen model from the movie "Cars"
I saw lots of Disneyana, artists, games, books, clothes, food, and characters. Guests were dressed as characters from movies like “Tron” and “Up” plus a plethora of princesses. I saw a few Belles and Cinderellas but not so many of the others. There was one guy walking around dressed as Prince Naveen and another guy as Prince Phillip (the “Sleeping Beauty” prince). Some costumes were elaborate and others not so much. Seeing other fans was cool and I even recognized a lot of the costumes from different Disney properties without having to ask. My favorite part of the expo was going through the gallery of PotC4 movie props. 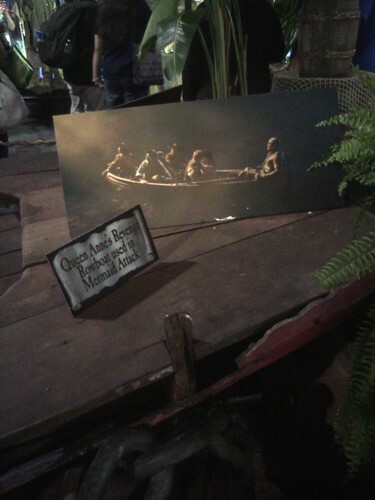 Movie still photo and card placed atop the prop boat used in the movie. Check out my Flickr page– on the right side of the blog– for more expo photos. I didn’t get to any panels, but I had enough to take in simply walking around the show floor. The guide book I got upon arriving had over 115 pages! As if that wasn’t enough fun, it was followed by a visit right up the street to Disney California Adventure with my family to watch the World of Color and try out a couple of the newer rides. Our favorite 3 rides include Tower of Terror, Midway Mania, and Soarin’ Over California. Have you been to Disney California Adventure? What’s your favorite attraction? 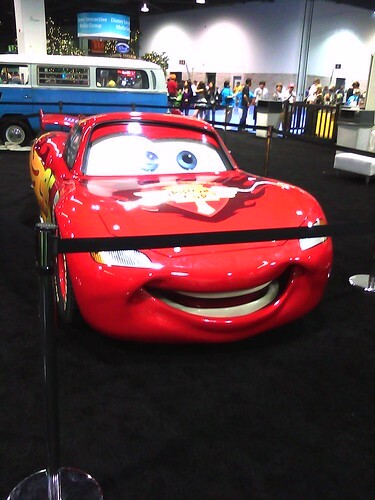 This entry was posted on Tuesday, August 23rd, 2011 at 1:49 am	and tagged with anaheim, D23 Expo, postaweek2011 and posted in Uncategorized. You can follow any responses to this entry through the RSS 2.0 feed. « Over halfway to the goal!